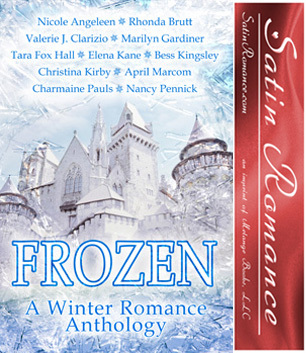 We are so thrilled to announce the release of our much anticipated winter romance anthology, FROZEN. Keep reading to find out more and to find out how you can win some great prizes! Jess and Derrick have been together for twelve years. When Jess finally gives Derrick an ultimatum, tie the knot or set her free, he proposes a bizarre test to decide their destiny. Casey is hell bent on getting Noah to sign divorce papers. Hiding out at his camp, Noah is hell bent on not signing. Procuring a snowmobile, Casey sets out in a blinding snow storm to find him. After crashing, she is near death when Noah finds her. Will a few cabin-bound days cause either of them to change their mind? Jack Frost gave his heart to Lilly the day she was born, making her the perfect leverage for a fire spirit whose heart is set on becoming Lord of Ice. Drew keeps proposing. Kate keeps saying no. It’s their little game. Can the holiday season change that? Kate has lost her best friend, and Drew does his best to cheer her up in this delightful story of love and memories. Lizbeth travels the world as a freelance photographer and answers to no one. After her last relationship, that’s exactly how she wants her life to be, easy and all her own. Jonas is staying at his family’s cabin while he deals with the loss of a fellow fallen solider. He wants nothing more than to be left alone and to avoid Christmas. Neither plan on spending Christmas with a stranger or finding the person who’s exactly what each other needs. A resort on the shores of Lake Superior in the middle of December was not exactly what Tiffany had in mind for a mid-winter vacation. But when she agreed to accompany her progressive grandmother on this frozen trip, she discovered that life is filled with possibilities, if you only go after them. In the depths of winter, Thomas Everett grudgingly meets his betrothed, Nila Sarvani, the daughter of a powerful sheikh. The passion they share takes them both by surprise, but the ruthlessness of American business threatens to tear them apart. Nila must decide if her dreams can be realized if she allows herself to fall in love. In a world surrounded by snow and magic, Cara finds herself grossly out of place. Ridiculed by all, she lives her life in terror from perpetual bullies until she runs into a stranger in town. Ben is everything she always wanted, but never expected. Better yet, he sees past her differences. Could Ben be her dream come true? Alaric has always loved the winter season, second only to his love of spells and sorcery. When his beautiful neighbor Cassandra reveals she’s a natural witch, he’s instantly smitten, even as he despairs of attracting her interest. Is there hope for a magical couple who thrive in different seasons? What happens when a single mother meets an old friend and, despite the conviction that she will never again open her heart to another man, finds herself falling in love? 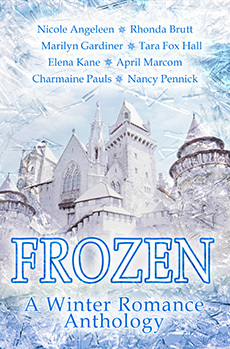 After the horrible year ice sculptor Sam McLeod has had, falling off a ladder at Nationals into the arms of her nemesis is the absolute last thing she needs. Or is it?